Osmin Soto had been downsized from two jobs in the construction industry and had gone to work for his dad, a general contractor in Los Angeles, when he decided it was time to make a change. At age 29, he could claim only a high school diploma and a certificate in computer-aided drafting and design, from a local vocational school. He sought a new trade that would get him a higher-paying job. This is how he found his way to a school called WyoTech in Long Beach, California. He could earn a degree in less than a year. A representative promised help with career placement. The price tag: $23,000. Soto is due to graduate next month, but he now wonders if his degree will have any value. He is one of approximately 70,000 students across the country caught in the collapse of Corinthian Colleges, WyoTech’s owner, amid allegations of false job placement data, and multiple state and federal investigations. In June, the Department of Education restricted Corinthian’s access to federal financial aid – the source of approximately 85 percent of its revenues – sending the for-profit college company into a financial tailspin, and ultimately resulting in a deal: regulators agreed to keep some money flowing to the company, and Corinthian agreed to sell 85 of its 107 schools within six months, and close a dozen others. Far from the board room machinations of a profit-making corporation squaring off with regulators, many students at Corinthian’s campuses have found themselves struggling to gain answers to simple yet crucial questions: What’s going to happen to my school? Will the degree that was supposed to be a big investment in a brighter future turn out to have been a very expensive mistake? Headquartered in Santa Ana, California, Corinthian bills itself as a company focused on meeting the “job-oriented needs of nontraditional students” through its Everest, Heald and WyoTech brands. CEO Jack Massimino led the company to $1.6 billion in revenue, offering programs ranging from medical assisting to criminal justice, and motorcycle technology. In its most recent annual report, Corinthian claimed that it placed 69 percent of its graduates in jobs. But the for profit-college industry has increasingly come under fire for leaving students mired in debt, sans well-paying jobs, and the Obama administration has proposed more stringent accountability measures, known as the “gainful employment” rule. In Corinthian’s case, allegations of falsified job placement statistics have dogged the company for years. In 2007, Corinthian settled a lawsuit with California Attorney General Jerry Brown that alleged that the company “overstated the percentage of its student who obtained employment” from vocational courses, “inflated starting salary information, and used these misrepresentation to convince potential students to enroll.” As part of the $6.5 million settlement, Corinthian paid $5.8 million in restitution to students, but it did not admit any wrongdoing. Corinthian spokesperson Kent Jenkins defends the accuracy of the company’s job placement statistics, citing extensive investment in internal resources, as well as relationships with thousands of employers across the country. Jenkins acknowledges that the company is aware of “two or three isolated instances in which questions have arisen given our job placement outcomes,” but says the company addressed them and self-reported them to authorities. “None of the inquiries currently under way has found systemic wrongdoing or companywide failure to comply with laws and regulations,” he says. Last October, California Attorney General Kamala Harris filed a fresh lawsuit alleging that the company had falsified job placement data. According to a Huffington Post investigation published last December, the company’s Everest campus in Decatur, Georgia, paid more than a dozen companies to hire graduates on a temporary basis. Corinthian closed the campus in 2012. The U.S. Attorney’s Office for the Northern District of Georgia is currently investigating the company, according to Corinthian’s public filings. 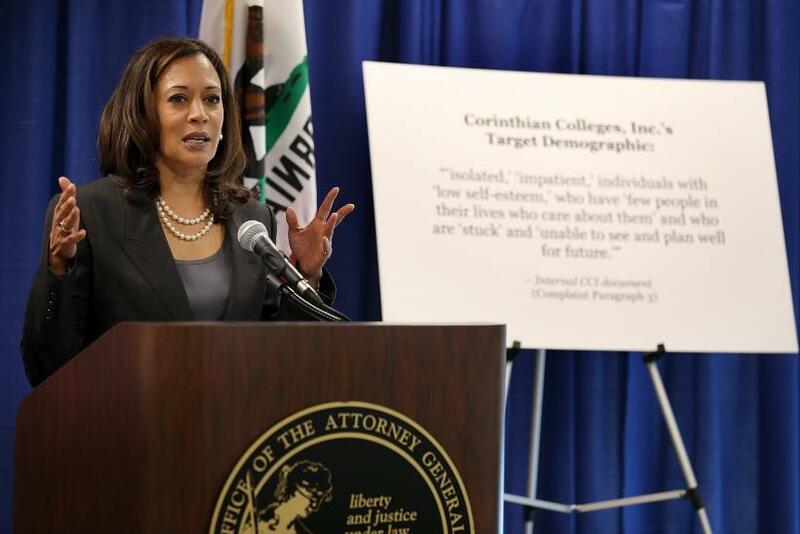 As Corinthian now shops its campuses, its legal troubles continue to mount. On August 13, the company notified investors that it received a grand jury subpoena from the U.S. Attorney’s office in the Central District of California -- signaling a potential criminal probe. The Securities and Exchange Commission, the Department of Justice, and the Consumer Financial Protection Bureau, among others, are also investigating Corinthian. All of that is playing out in another realm from the company's customers -- the students who now wonder what lies ahead for them. Osmin Soto, along with a classmate Gustavo Padilla, were drawn to the same electrician program that Corinthian touted in its 2013 annual report, featuring the story of a woman named “Stefanie.” For years, Stefanie was immersed in heavy drinking and drug use, bouncing between jail and homelessness, went the story. She eventually checked into rehab and applied herself at WyoTech Long Beach, scoring perfect attendance and rising to the top of her class. “Despite her academic achievements, Stefanie’s background made it tough to land a job,” the report said. But Stefanie didn’t give up, and the school pitched in to help. Both Soto and Padilla believed they would have a lot of help getting jobs, too. “They promise you everything,” Padilla says. Padilla had dreamed of becoming an electrician ever since he was a kid growing up in Petén, Guatemala. “I like to know how to connect things, how cool it is to turn a switch, and see everything come on,” he says. He moved to the U.S. four years ago, enrolled in ESL classes to learn English, and started working in restaurants, where he earned $11 an hour. WyoTech seemed like a gateway to his dream job and a higher paycheck. He visited the campus last summer, and a representative told him he could expect to earn $13 to $15 an hour “just to start.” Padilla also asked if the school would translate his high school diploma from Guatemala into English; he figured employers would need to see this, and that it would be expensive to translate on his own. “The diploma is in Spanish. They said they would translate it to English,” he recalls. To pay for the program, Padilla obtained a grant for nearly $4,000, took out federal student loans for $10,000, and agreed to pay $870 a month while he was in school. Where Padilla set his sights on becoming an electrician early in life, Soto’s path was more circuitous. He graduated from James Monroe High School in the San Fernando Valley in 2000, and was accepted to Cal State’s Dominguez Hills campus. But the Guatemala native was also undocumented at the time, and decided instead to attend community college and work. Soto attended first Santa Monica College, then Los Angeles Trade Tech College, holding jobs at McDonald’s and Radio Shack along the way. Balancing school and work was overwhelming. Though he did obtain his legal residency, he did not complete an associate’s degree. “Life got in the way,” as he puts it. But he was good at sales and stuck with Radio Shack for six years, and then switched to sales at a motorcycle dealership. “In one week I made over $1,000, but it wasn’t like that all the time,” he says. At West Valley Occupational Center he studied computer-assisted drafting, and learned how to draw up construction site blueprints. He went to work for a general contractor, in an office with a cubicle, “which was something new for me,” he says. But over the next several years, while California’s housing market faltered, Soto says he was downsized from two positions creating blueprints. He started to pick up jobs from his dad’s business, like installing fans and light switches -- jobs that “had nothing to do with design.” Nevertheless, he felt fortunate for the work, and liked it well enough. He started to envision a life as a certified tradesman. He’d already been considering WyoTech when he discovered that his family was about to expand: his wife was pregnant. Soto was willing to take on the debt that accompanied his choice. He borrowed about $8,000 from the federal student loan program, and another $7,000 from Corinthian’s own lending program, Genesis. Corinthian has maintained that the program enables students to attend school when they don’t have another source of financing. But critics charge that such “institutional loan programs” don’t consider students’ ability to repay the loans, and lead to sky-high default rates. Since for-profit schools have to show that at least 10 percent of their revenue come from sources other than federal student aid (known at the “90-10 rule”), “schools seem to view these loans more as ‘loss leaders’ to keep the federal dollars flowing,” the National Consumer Law Center said in a 2011 report. The Consumer Financial Protection Bureau has been investigating Corinthian’s practices regarding private student loan origination since 2012, according to company filings. Over the course of Soto’s school year, other investigations piled on: In addition to the California Attorney General’s suit, filed last October, the Iowa Attorney General notified the company in January of this year that it was leading a multistate investigation into Corinthian’s business practices (16 states, in total, are now part of that investigation). In January, the Department of Education, which oversees school compliance with federal student aid requirements, began to request more information about Corinthian’s job placement results, grade changes, and attendance records -- an inquiry that would eventually push Corinthian to the brink. "They Were Thrown Into A Room"
The WyoTech electrician program is broken into nine modules, and each one lasting about four weeks. The mods cover topics ranging from basic electrical theory to advanced industrial controls. Lessons in the later mods build off what students learn in the earlier mods. “I believe the program itself is great,” Soto says. He was excited to begin, and started out in the earliest mods, first completing mod 2, then mod 3, then mod 1. But as the months wore on, he became concerned about the quality of the education in his program. He was troubled by an influx of brand new students starting in his higher-level classes, and interrupting the pace of instruction. “I noticed that a lot of our education had to be halted,” Soto adds. Soto developed a growing sense that “there was really no organization at this school.” And in April, his own life became more complex: His wife was living in Guatemala and about to give birth. Soto requested a two-week leave from a top administrator for a family emergency. The administrator told him he’d be dropped from the program and would have to go through the process of re-enrolling upon his return. Soto then heard from another school official that he could have simply requested an extended leave of absence. By the time he returned from Guatemala and was able to sort out the re-enrollment process, he had missed the start of the current mod by several days, and was told he’d have to wait almost a month -- until the beginning of June – to start class again. “Which is kind of hilarious,” Soto says, because come July, “we had no instructor for a week and a half.” Around this time, both Soto and Padilla say supplies were running low, and that students didn’t have enough instructional materials, such as pipes, to practice on. As Padilla’s own graduation date neared in July, he says he repeatedly contacted WyoTech’s career services for help with his resume, interviewing tips, and finding a job. He never heard back, he says. He also found out the school had not, and would not, translate his high school diploma, as they’d promised when he enrolled. The job he did find, on his own, as an electrician’s apprentice, pays the same as he was earning doing kitchen prep while in school-- $11 an hour. “I just wanted to make $1 or $2 more than I was making in a restaurant,” says Padilla. And yet, despite feeling betrayed by the school, the news that WyoTech’s parent company is shutting down has left him despondent, too. “I feel like my diploma doesn’t count anymore,” he says. To be a viable candidate for a job at a big company that pays well, he fears he would have to attend a different program altogether. “If your school is sold, it may continue to operate after it is sold in much the way it does now. However, certain changes may occur. As stated in your Enrollment Agreement, WyoTech reserves the right to change instructors, textbooks, accreditation, schedules, or cancel a course or program for which there is insufficient enrollment. If your school is sold, the new owner may choose to make some of these changes or other changes. Soto tried calling that very evening, he says. Someone answered, said they would transfer his call, and then hung up.